Special Topics in Econometrics. Economic data issues (Z. Griliches). Functional forms in econometric model building (L.J. Lau). Limited dependent variables (P.J. Dhrymes). Disequilibrium, self-selection and switching models (G.S. Maddala). Econometric analysis of longitudinal data (J. Heckman and B. Singer). Selected Applications and the Uses of Econometrics. Demand analysis (A. Deaton). Econometric methods for modeling producer behavior (D.W. Jorgenson). Labor econometrics (J.J. Heckman and T.E. MaCurdy). Evaluating the predictive accuracy of models (R.C. Fair). New econometric approaches to stabilization policy in stochastic models of macroeconomic fluctuations (J.B. Taylor). Economic policy formation: Theory and implementation (Applied econometrics in the public sector) (L.R. Klein). 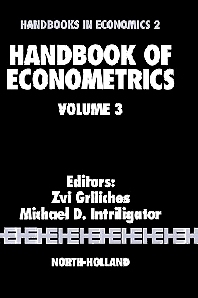 The Handbook is a definitive reference source and teaching aid for econometricians. It examines models, estimation theory, data analysis and field applications in econometrics. Comprehensive surveys, written by experts, discuss recent developments at a level suitable for professional use by economists, econometricians, statisticians, and in advanced graduate econometrics courses.